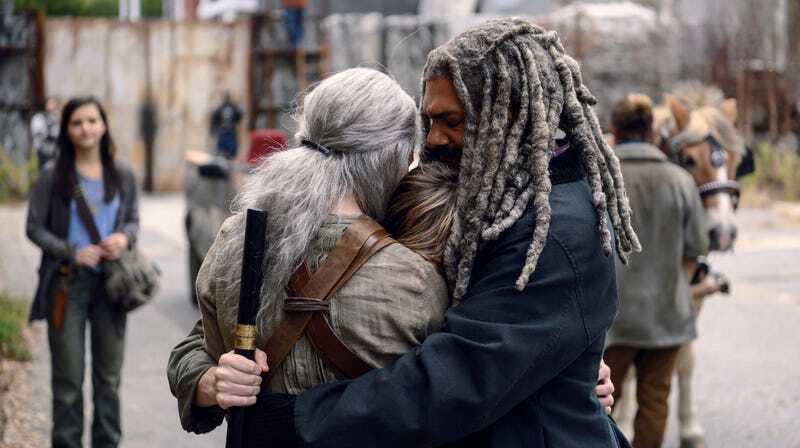 Carol (Melissa McBride), Henry (Matt Lintz), and Ezekiel (Khary Payton) have a happy family reunion. Guys, I haven’t been this stunned by an episode of The Walking Dead in so long. I mean, I was pleasantly surprised when a zombie knifed Jesus, I’ve enjoyed the wackiness of the Whisperers and the Highwaymen, and I’ve loved the bizarre way Rick was taken off the show. But last night’s episode was just fantastic—and it had an ending so shocking my jaw literally dropped. The second thing is that way back in season four, I called the final Rick-Governor showdown the show’s “Red Wedding” moment, mainly because of how much violence there was and how many characters were killed—plus that amazing, horrific shot of baby Judith’s car seat covered in blood. I would like to rescind that, because while it was indeed violent, the fight wasn’t shocking, really; we knew the Governor would come and there would be a battle. And sure, we’ve also known the Whisperers would be coming to mess with the communities for taking in Lydia, and we’ve all suspected it would happen during the big fair since people on The Walking Dead can’t have nice things. Nabila (Nadine Marissa) and Jerry (Cooper Andrews) have a happy family moment. Connie (Lauren Ridloff) has a happy reunion with her sister Kelly (Angel Theory). Alden (Callan McAullife) and Enid (Katelyn Nacon) share a happy moment together. Lydia (Cassady McClincy) and Henry (Matt Lintz) share a happy kiss together. It’s their last.